Bugs dine on a variety of plants and fruits, and lemons and other types of citrus fruit are not excepted despite their bitter rinds. Several types of bugs eat the fruit and leaves of lemon trees. Insects damage lemons when they feed on them, causing considerable hardship for growers, who can lose portions of their crops to the little critters. Citrus thrips have elongated yellow-orange bodies with three pairs of legs and two antennae. The bugs hatch from eggs laid on lemon tree leaves, flowers or fruit, and then become wingless larvae, commonly called nymphs. Nymphs look like tiny worms. Nymphs pass through several stages of development before the bugs chang into adult form. Nymphs obtain the food they need to transform into mature thrips by eating lemons. Citrus thrip nymphs eat the tops of the fruit, causing a ring of gray or silver marks called ring scars. Nymphs prefer to eat flowers and young fruit less than 1.5 inches in diameter. A variety of mites feed on lemons, including broad, Texas citrus, six-spotted, citrus rust, citrus bud, brown rust and citrus red mites. Mites vary in appearance depending on the species. The citrus rust mite is yellow with a wedge-shaped body, while the citrus red mite is red or purple and has a round body. Some mites are so small that it’s hard to spot them on a lemon tree’s fruit or leaves. When mites feed on lemons, the fruit can develop silvery or brown marks, or appear misshapen or distorted as they grow. Citrus cutworms hatch from eggs laid on lemon tree leaves by cutworm moths. Cutworms begin their lives as greenish larvae but eventually turn pink or brown with white stripes on either side of their bodies. The worms range in size from a half-inch to three-quarters of an inch. 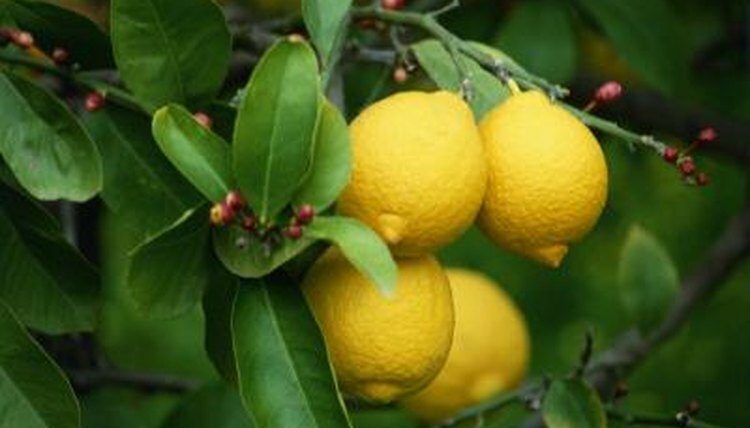 Cutworms can cause significant damage to a lemon crop due to their preference for sampling many different lemons, rather than feeding on one lemon. Two types of parasitic moths are predators of the citrus cutworm. Mediterranean fruit flies feed on lemons. The flies have black bodies with silver specks and beige- or tan-striped abdomens. Mediterranean fruit fly larvae are wingless during the larval state, but they develop wings at maturity. Female fruit flies lay their eggs under the rind of the lemons. Larvae hatch from the eggs two to four days later. During the next week or so, the larvae feed on the lemons. After they’ve finished feeding, they tunnel out, leaving behind decayed fruits that aren't suitable to eat. Several other types of insects eat lemons, including forktailed katydids, European earwigs, caterpillars, spined citrus bugs, bronze-orange bugs, hard and soft scale insects, caterpillars and moths. These insects cause varying types of damage when they feed on lemons. For example, the forktailed katydid, a grasshopperlike creature with long antennae, causes scarring on the lemon surfaces and misshapen lemons, while the spined citrus bug causes lemons to change colors and drop to the ground too soon, or to dry out inside.